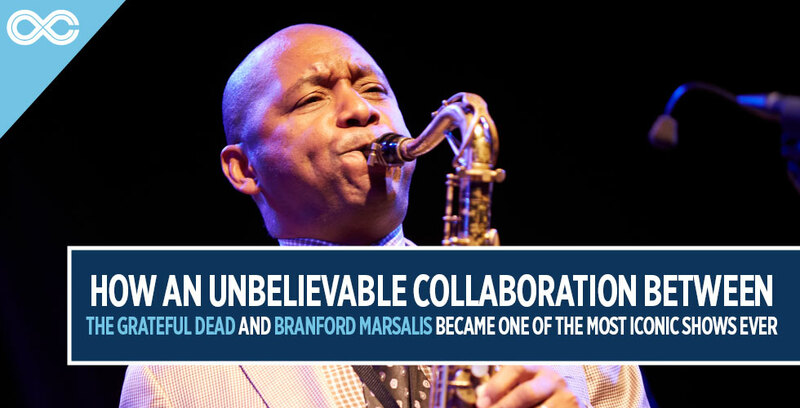 28 years ago, acclaimed jazz saxophonist Branford Marsalis walked across the stage at the Nassau Coliseum in Uniondale, NY to join forces with the Grateful Dead for what would be one of the most celebrated and talked-about shows in both careers. Today, fans continue to share songs and stories while they commemorate this special day in music history. It’s a day that continues to live on and resonate with Deadheads of all ages. As unlikely as it seemed, the worlds of Marsalis’ jazz and the Dead’s jam-o-sphere were closer than anyone could realize. This was all thanks to Phil Lesh’s background as a classical composer and appreciation of avant-garde jazz, which is what led the Dead to the door of Marsalis before their formal introduction in March of 1990. “Phil was the only guy who knew who I was. They had had jazz guys sit in before with varying degrees of success. Mostly, lack of success because a lot of the guys who are up there playing with them didn’t grow up playing popular music,” said Marsalis in an interview with the Wall Street Journal. Originally slated to perform “Bird Song” with The Dead, Marsalis was not expecting an invitation from the band to stay and jam the second set with them. This would include a performance of “Dark Star,” a tune that had been out of the Grateful Dead’s live rotation for over six months. “That had no significance to me. I’m like, “‘Dark Star?’” “Okay. What is it?” “Oh, you’re gonna love it. It’s free, it’s out.’ Great, I can play out,” said Marsalis in a 1996 interview. What followed suit has gone down in Grateful Dead lore as the beginning of one of the most pivotal partnerships in the band’s career. The second set alone is the stuff of Dead legend, with an exceptionally poignant yet free-flowing “Eyes of the World” into an equally prolific “Estimated Prophet,” which boasts one of the best introductions to the tune as Marsalis’ saxophone compliments Phil Lesh’s bass line almost too perfectly. However, the aforementioned “Dark Star” quickly became the most respected tune from the ensemble, with Marsalis leading the jam into the second half of the song and asserting his dominance. I was actually playing with them. I wasn’t just playing my thing. Through the following years after Marsalis’ first taste of playing with the Grateful Dead, he would go on to play 4 other shows with the group, most notably their 1990 New Year’s Eve show, which featured a particularly fun, and energetic “Not Fade Away.” While his last show with the Grateful Dead occurred in December of 1994, he has long since appeared alongside the “Core Four,” including gigs with Furthur. Now, you can be lucky enough to catch Branford Marsalis sit in with Dead & Company exclusively at LOCKN’ on August 25 and 26! Get tickets now!